Goochland’s Katie Waller wanted to go big. She did so and she crushed it. Waller’s senior project was putting together the Bulldogs’ “Ballin’ for a Cure” benefit game, an endeavor that touched close to home as her sister Samantha battled with cancer. 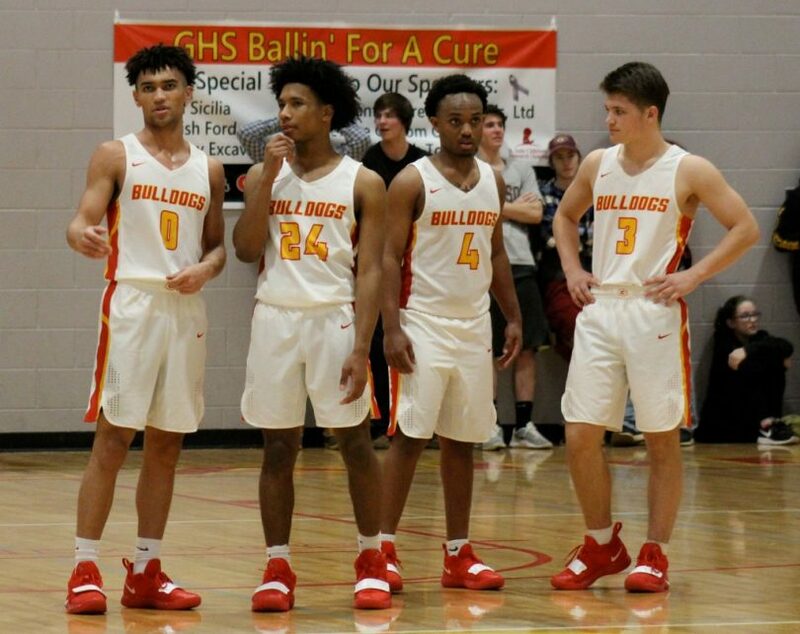 With organizational help from Goochland boy’s basketball assistant coach AJ Nash, who himself lost his mother to cancer just over two years ago, the Bulldogs managed to draw in a standing room only crowd and sell out of every product for their fundraiser on Friday. So with an impressive check ready for the mail headed to St. Jude’s, Friday’s capacity crowd had a cause behind it and great matchup as Goochland took the court looking to avenge its only James River District loss against a visiting Bluestone squad. They followed through too. The first half was a dog fight. The second was a showcase of the Bulldogs’ tenacity on defense as they held the Barons to just 11 second half points in a 53-39 win. “My sister really came through for us tonight with a win like this,” Waller said. No pressure for the Bulldogs in the night cap, right? Goochland trailed Bluestone’s lengthy lineup that runs a 3-2 zone press in the first quarter 17-14 but when Kameron Holman put the Bulldogs up 18-17 in the second quarter, it was the start of a wave that was decidedly red and gold, but one that took a little to take hold. Goochland trailed 28-26 at the half with Michael Harris doing a little bit of everything with his 11-point first half effort for the Barons. 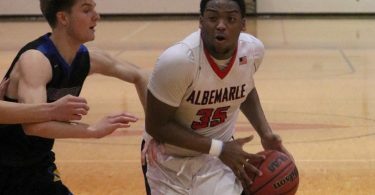 While Bluestone was able to keep Goochland star guard Deion Harwood to perimeter shooting in the first half, the senior still nailed a trio of three pointers while Holman held down the fort offensively in the paint and with his jump shot. Things changed in at the break though. 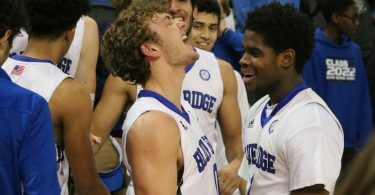 Harwood started finding lanes in the paint and Holman kept up his production while on the defensive side of the ball, Quincey Snead and Isaiah Matovu wreaked havoc forcing turnovers left and right. Goochland started the third with a 9-0 run behind that play and with freshman J.B. Bell’s put back with 3:28 left in the frame, Goochland held a 7-point lead. “The turnovers were amazing and they didn’t shoot like did in the first half and I like to thing that had a lot to do with what we did on defense,” Gordon said. The Bulldogs took their first double-digit lead in the beginning of the fourth on another basket from Bell to make it 44-32. From there, Goochland went to work on the clock while maintaining its intense ball pressure on defense. Harwood attacked the basket and when he was unable to finish at the hoop, he went to the free throw line and delivered there to make it 52-37 with 2:09 to play. The Barons tried briefly to foul back into the contest but it was to no avail with the Bulldogs shooting just under 80% from the line for the night. Harwood led all scorers with 21 points to go along with seven rebounds. Holman had 17 points and six rebounds with 15 points coming in the first three quarters. Matovu finished with five steals while Bell had nine points. Goochland (11-3, 9-1) hosts Buckingham County on Monday night.